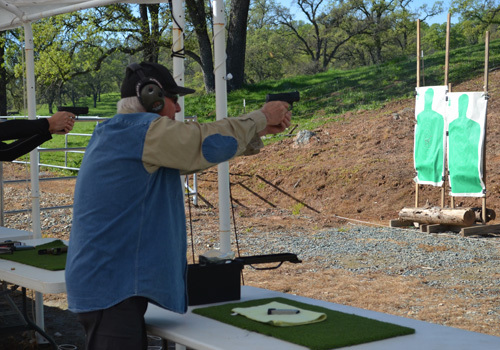 Protect Yourself With Our DefenseSHOT California Concealed Carry Weapon Class For Sacramento County Residents! Book My CCW Class Now! Would you like to get a CCW Permit to protect you and your family? If you are looking to protect yourself and others, getting a CCW (Concealed Carry Weapons) permit is the best form of immediate, personal protection available. 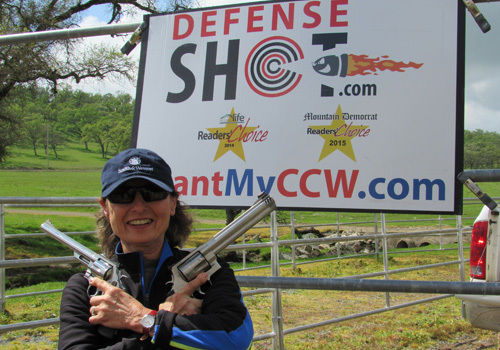 Let me guide you through our DefenseSHOT official CCW Permit Course for Sacramento County! My course will certify you for an official California CCW license, valid throughout the state of California. Right now regulations have changed on both on a local and state level, this is one of the best times for Sacramento County residents to obtain a CCW permit. My Sacramento County Sheriff’s Department Offical Certified, 16-hour course has been designed for Sacramento County residents to obtain your California CCW license. We will cover everything that you need to know for carrying and shooting a concealed firearm with confidence. And I guarantee you we will have FUN learning it! I will train anybody, who meets the basic requirements for firearm ownership, to shoot a firearm effectively. Women, men, new shooters, accomplished marksmen will all leave my CCW permit course with the proficiency and skills, responsibilities and legal knowledge necessary to carry a concealed firearm. While I am fully versed in the instruction manuals and NRA* standard guidelines, I choose to implement a training model that is exclusive to the individual student and class. I do not simply repeat what is in the official course content and read out of a book. My classes are structured exclusively by me. I’m not repeating someone else’s script. They are also tailored to individual needs. The first day of class is held at our beautiful and comfortable El Dorado Hills classroom where you will be seated at a table in your comfortable padded chair. The classroom is large and allows you to stand or walk around if needed. The first day of class you will not need a gun. A pen, a piece of paper and your lunch are all that is necessary. I say “a” piece of paper because you will find it’s not necessary to take a lot of notes. With my style of teaching, you will find that you simply “own” the new information. This is one reason I receive so many rave reviews from career teachers. The second day of class is held at our beautiful DefenseSHOT private shooting facility which is only minutes from our classroom. There is no need to be apprehensive about shooting. Safety and Shooting facility etiquette was covered on day one. You’ll be ready. Your second day of class will start off slow and methodical. You’ll be taking your time to work on target shooting. Once we have the target shooting dialed in we’ll slowly and smoothly transition into defensive shooting. By the end of class, you’ll be capable of rapid firing accurately on target including quick target acquisition, shooting multiple targets and more. We’ll also push these skills off into your subconscious so you can do them without actively thinking about them. By the end of day two, you will be astounded how much your shooting has improved. As a result, with your new shooting abilities, the mandatory shooting test will seem so simple you’ll be amazed. There’s also a good chance that your next trip to the public range will be different. Don’t be surprised if other shooters start asking for your advice. I do not have a drill instructor or militaristic style at the shooting facility. It is structured and safe but you won’t feel like you’re in boot camp. Again the more relaxed the atmosphere, the better you learn. We can add stress later only if you want to, but it will be for fun, so you can learn to operate under pressure, not as part of the mandatory training. But Wait! I Don’t Know How To Shoot Yet and I Want To Get My CCW! With our beginner handgun class, you will go from zero knowledge of guns, to ready for CCW class in 3 hours flat! You’ll love our Beginner handgun class. It’s designed for those who have never shot a handgun before and want to get a CCW. This is where a majority of my students, who were relatively new to general firearms (including many who have never having shot before), have experienced a stress-less day. You will have a great time of learning in our beginner handgun class. Which is designed to take someone who has never touched a gun before and get them confident and ready for our CCW class in one easy step! Have a full understanding of firearms management, care, and use including buying, cleaning, transporting, storing and using all forms of handguns. 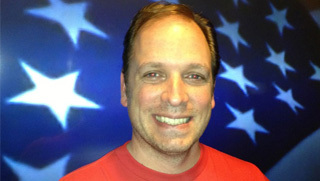 Have an extensive proficiency regarding concealed carry weapons laws (Local, State, & Federal). Be confident and comfortable in the physical operation aspects of your firearm as well as others. Officially be CCW training certified in California for Sacramento County residents. Have extensive knowledge and comprehension of concealed carry tactics, and self-defense. Know how to read your surroundings the way cops read our surroundings which not only gives you the tactical edge, it often allows you to get out of trouble before it happens. This portion of the class alone is so valuable that I have had many people bring their teen agers back through the class just to learn this skill set. I love to empower people! My career as a law enforcement officer, being a licensed driving instructor training everyone from kids on the freeway to people on the racetrack and even officers training at the CHP emergency vehicles operation course facility. Along with many thousands of hours of law enforcement training and as a youth pastor, have helped me to design a learning environment that is FUN, effective, and unforgettable! With thousands and thousands of successful CCW students to my credit, I can guarantee that you will be MORE than satisfied with my course! As a student in our class, you are in a group of people that includes superior court judges, non-peace officer staff, and administrators from surrounding law enforcement and government agencies, attorneys, retired cops and their families as well as an extensive and diverse group including everyone from college students to retirees. 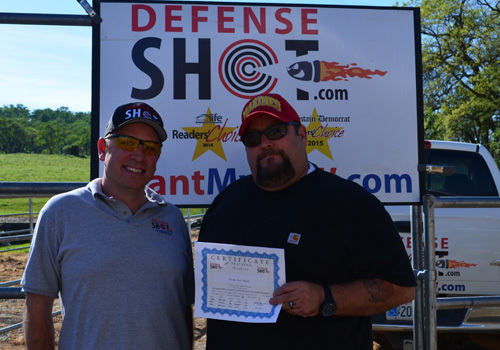 There is a reason that DefenseSHOT attracts so many professionals with ties to law along with our general crowd. It’s because you are choosing the best CCW training available and referrals by professionals from government officials to judges and officers know it. I make attaining top notch training and knowledge easy, fun and stress-free. Book a CCW class with me, and we will have a fun and fulfilling experience at our beautiful classroom and private, DefenseSHOT shooting facility. This two-day experience with me will give you the skills and confidence you need to protect yourself, your family and others for a lifetime. I know that for many new to the Concealed Carry Firearms Community, there is a lot of room for uncertainty. Especially when it comes to understanding the laws and regulations of firearms, not to mention the tactics, and skills necessary to handle a firearm well. I level the playing field for responsible citizens like you and help you protect yourself and your family. When you prepare yourself by taking my Sacramento County Concealed Carry Permit course, you will provide a more safe, secure and confident future for yourself, your family and our community. After a few months, the Sacramento County Sheriff’s Office will call you back in for a quick oral interview. There’s nothing to be anxious about. By this time you will have taken our DefenseSHOT CCW class. This will make your interview easy because you will have the best training and you’ll know what you are talking about. Keep in mind, in all the years we have been doing this we have never had a student denied. Also, when they see you received your training through DefenseSHOT they know you have received top notch training. I have trained many of their staff. And their staff who have taken our class refer their friends and other staff (unofficially). They are familiar with us and clearly are pleased with our DefenseSHOT certifications. Expect to learn a new perspective of what firearms and concealed carry responsibilities are all about! Expect to have a great time and share a fun experience with the other people in your class! My teaching methods have skyrocketed the shooting proficiency of students often beyond the skill level of many of my partners in law enforcement after only one day of training following our Sacramento CCW class in our Advanced Defense Shooting Classes. I have also used my methods to assist active law enforcement officers to surpass firearms qualifying requirements they were struggling with. As well as setting a foundation for those going into law enforcement academies so that they are ready to surpass all training requirements and tests. At the beginning of the course, I will give the location and directions to the DefenseSHOT firing range. Which is only 8 minutes away. SAFETY FIRST! – I can never emphasize the first line enough! Before we leave the classroom, you will have a thorough understanding of range safety, and the voice commands you need to know and follow for the shooting portion of the course. When we get to the firing range, I will also brief everyone about voice commands, range safety, and the “Rules of the Range” that we discussed in the classroom. Have the best day you have ever experienced shooting. Breeze through the required shooting test (with your new skills). Our private shooting facility allows us the freedom to try all kinds of training that you could never do at a public shooting range. Training that is vital to you as a CCW carrier. A pen, a piece of paper and your lunch. You will not need your gun on the first day of class. Comfortable “outdoor” clothes (weather appropriate). Our shooting facility is outdoors and has 1000 square feet of roof as well as cooling misters in the summer. Crew neck shirts are better than v necks, so you can avoid the experience of having the “hot brass” in your shirt. Pants or shorts are fine. A baseball cap is recommended.It keeps the brass off your head. Comfortable shoes: athletic shoes or boots. No open toe sandals, please. Bring a pen and a piece of paper for notes. Bring safety glasses and hearing protection. (Sunglasses and Rx glasses are fine if they have a safety rating). We do have eye and ear protection available for you if needed. A minimum of 250 rounds ammunition for your personal handgun or guns. If you are bringing multiple guns you’ll want at least 50 rounds per gun with a total of at least 250 rounds. By the end of class, you will be shooting 6 rounds a second. The ammunition will evaporate quickly when we do that. As the day goes we will keep turning up the fun dial – which will require ammunition. A holster is NOT mandatory. Sacramento County runs from the low delta area between the Sacramento River and San Joaquin River, north about ten miles past the State Capitol and east ti the base of the Sierra Nevada Mountains. The southernmost part of the Sacramento County end, and adjacent to San Francisco Bay. Sacramento County offers a wide variety of activities that will engage and excite a wide range of visitors from all over.